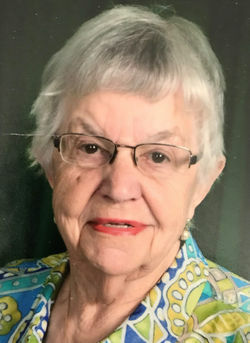 Dolores Ann Rasmussen, 89, of Forest Lake, formerly of Willmar, died Thursday, January 31st at Cherrywood Pointe in Forest Lake. Her Mass of Christian Burial will be 11:00 am, Wednesday, February 6th at Church of St. Mary with burial in Fort Snelling National Cemetery. Visitation will be from 5-7 pm, Tuesday at Harvey Anderson Funeral Home in Willmar and continue one hour prior to the mass on Wednesday at the church. In lieu of flowers, memorials will be donated to Fairview Hospice in Chisago City, MN. Dolores was born on June 28, 1929, in Melrose, Minnesota, the daughter of Joseph and Bernadine (Austing) Kemper. She grew up in Melrose where she attended St. Boniface Elementary School before moving to Tacoma, Washington. She returned to Minnesota and moved to Osakis. On October 5, 1950, she was united in marriage to Roger Rasmussen in Osakis. They lived in Waukegan, IL, and Newport, R.I., while Roger was in the service. Upon his discharge, they lived in Valley City, ND, (1955-58), Boyd, MN,(1958-62) and Pine River, MN (1962-64) before settling in Willmar in 1966. They recently moved to Forest Lake to be near their children. Dolores was baptized and confirmed at St. Boniface Catholic Church in Melrose and was a member of Church of St. Mary. She was an active supporter of the church bazaar where she was Co-Chair. Surviving are her husband, Roger; children: Steven (and Jean) Rasmussen of Forest Lake; Gary (and Dianne) Rasmussen of White Bear Lake; Cheryl (and Scott) Bakken of Lindstrom; Ann (and Marty) Sonnek of Wyoming, MN; Rolf (and Chery) Rasmussen of Willmar; 11 grandchildren; two step grandchildren and four great grandchildren. Also surviving are her siblings: Marcella Radermacher of Sauk Centre; Loretta Didier of Albany; Adeline Kemper of Tacoma; Irene Harmeling of Newport, MN, Marina Koopmeiners of Albany and Marvin Kemper of Melrose. She was preceded in death by her parents, and siblings: Viola Evans, Helen Hunt, identical twin sister Dorothy Moorman, Raymond Kemper and Richard Kemper.